Reimagining a classic pool is a tall order, especially when the original was a legendary regional favorite. But that's the task that confronted Gary Novitski and his colleagues, who started by cleaning the slate and then delivering four new watershapes to meet modern-day aquatic needs. With the effects of the Great Depression still rocking the economy in the mid-1930s, the Works Progress Administration became a major employer and creative force that put many still-treasured public facilities on the map. In fact, there are few cities in the country that don’t boast a park, bridge, post office or some other public structure built by some of the millions of laborers who found work through the WPA. In 1937, Vincennes, Ind., was a particularly fortunate beneficiary of WPA’s prowess in the form of the Rainbow Beach Aquatic Center – one of the most innovative and distinctive of all such facilities built up to that time. The goals were two: to provide jobs for the unemployed and to address an alarming increase in the number of children drowning while trying to swim or cool off in the nearby Wabash River. As designed by the local architectural firm of Sutton & Routt, the original pool had a sandy beach surrounding a vast pool. There was a tall tower in the middle that contained numerous diving boards as well as a central cascade where the water flowed down in front of variously colored incandescent lights – hence the facility’s namesake “rainbow” effect. This was among the first and only public pools to incorporate both a beach entry as well as a water-and-light feature. By 1971, however, Rainbow Beach had seen better days and an extensive renovation plan began taking shape. The sandy beach wouldn’t survive the update and the pool took on a more conventional look, but the name survived. Forty more years passed, and by 2011 it was again time to revamp and upgrade Rainbow Beach. This time, however, it was decided that the pool and its surrounding amenities needed complete reconstruction, meaning a considerable amount of money had to be raised through taxes, bond issues and private funding. This took time, of course, but eventually it all came together and the reshaping of the Rainbow Beach Aquatic Center began when we at Renosys (Indianapolis, Ind.) signed on to start design/project documentation work in 2013. The revised facility was to include four separate bodies of water – three pools and a splash pad. Once those plans emerged, additional private funding added a climbing wall and a lily-pad walk. Also to be included: a bathhouse and a new concession area that would tie the aquatic center to adjacent Gregg Park. Once all of the necessary funding was in place, the job went out for bid and we won the contract. The original Rainbow Beach Aquatic Center pool was long gone by the time we came on site, but it had charms we kept in mind in devising its replacement. To bring that new vision to light, we had to demolish a heavy-duty, extra-thick shell and cart away thousands of square feet of well-engineered decking. The main pool was to include two large flume slides (one open, one closed) and would be divided into two sections: a shallow plunge pool into which the slides would empty alongside a deeper section with eight swimming lanes for competition and lap swimming. This one was to contain a bit more than 173,000 gallons of water. This second pool would serve the needs of smaller children and families and would also feature two sections – a shallower one with a zero-depth entry and a play structure with a small slide, and a slightly deeper “activity” pool which would feature the lily-pad walk. This vessel was to hold more than 41,000 gallons of water. The third vessel would be a diving pool – something not commonly found in today’s aquatic facilities. This deep pool, with a capacity of approximately 74,000 gallons, was to feature diving stands and boards as well as a 12-foot-tall climbing wall overhanging the water. We set up the foundations and steel walls for the three main pools and hoped to complete their concrete floors before winter set in, but Mother Nature wouldn’t cooperate – and then limited our ability to move along after the thaw, hobbling us with an unusually wet Spring. The fourth watershape was to be a splash pad equipped with water-dumping and spray features throughout. This portion of the facility would jut out into Gregg Park and was to be kept open to the public after pool hours so folks would have the opportunity to cool off and have fun on warm summer evenings. The play features were to be provided by Water Odyssey (San Marcos, Texas) and would include a water tower, a splash umbrella and misting water wickets. In addition to the pools, we were to build the facility’s new bathhouse with men’s and women’s locker rooms as well as offices and concession areas. The new facility was scheduled to open by Memorial Day weekend in 2017, but we ran into a string of challenges that knocked us a bit off course. For starters, when we began demolition of the old pool in the fall of 2016, we discovered an unusually thick section of concrete below the shell. This came in addition to removal of nearly 52,000 square feet of well-engineered decking, and by the time the site was cleared and ready for new construction, three months had passed and a bitter winter had settled in. We kept going through December, however, placing the steel walls for the three main pools and making ready to pour their concrete floors. But the weather didn’t cooperate and we had to push off the concrete placement until the first thaw of 2017. Setting up an equipment room for one commercial watershape is no small task, but finding pathways across a congested construction site as well as room for four completely separate systems in a single, relatively compact space offered juggling tasks of major proportions, particularly given the different needs of each of the four systems. We planned thoroughly, took our time and pulled everything together with no significant hitches – and managed to accommodate service access as well! Warmer weather eventually returned, but with it arrived a bout of unusually wet days that turned the job site to mud. We kept going by shifting our focus to the bathhouse and associated facilities, but even here, workers had to tromp through the muck, then change their shoes before climbing up ladders to work on the buildings. It was an incredible mess, but fair weather eventually returned and we were finally able to build the pools and the splash pad. Here, for course, there were challenges having to do with routing pipes and conduits to the facility’s mechanical/pump room. Having multiple pools in one area is always an organizing nightmare with respect to pipe runs, and Rainbow Beach had four separate bodies of water. The upshot is that we had to plan well in advance for each system, mapping everything out in a logical pattern to allow for efficient service later on. The new facility’s four watershapes offer a variety of forms and features intended to update Rainbow Beach with modern convenience, amenities and safety in mind. The sand beach and rainbow lights are no longer part of the program, but now there’s a full spectrum of primary colors on display in the play features and ample opportunity to lounge at the water’s edge, either in sun or shade. There was no equipment shared among the four bodies of water, basically because each was to have a different turnover rate to comply with state and local codes. The diving pool, for example, wouldn’t need to turn over as often as the kiddie pool because of a far lighter anticipated bather load in the bigger, deeper vessel. The resulting mechanical/pump room is a 28-by-33-foot structure that includes an eight-by-12-foot chemical storage room. The competition/activity pool operates with vacuum filtration systems we provided; these are flooded systems that use gravity flow, so they were installed in tanks set below water level. All of the other equipment, including the sand filters (Pentair Commercial Aquatics, Sanford, N.C.) that serve the kiddie and diving pools, was set at deck level. Not only was Rainbow Beach renovated for aesthetic and user appeal, but it was also updated with environmentally friendly and efficient operating systems. 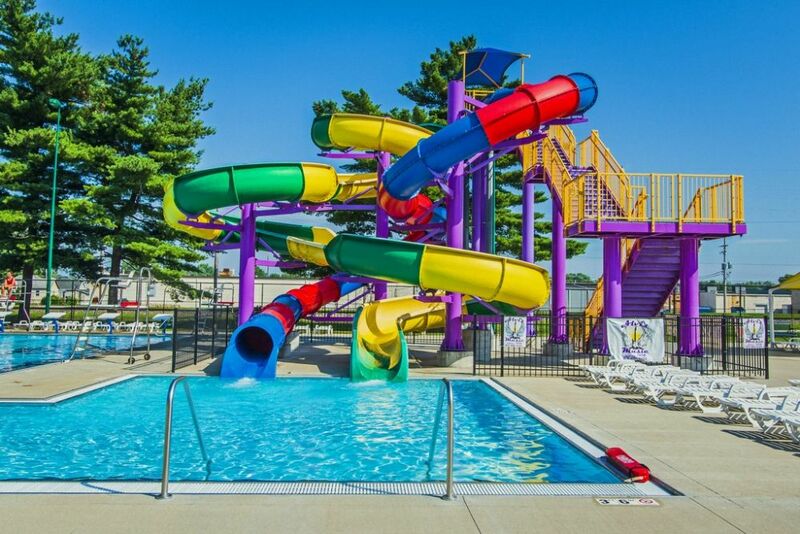 We weren’t able to make the Memorial Day deadline, but by July 4, 2017, the new Rainbow Beach Family Aquatic Center was up and running – and making the patient citizens of Vincennes very happy indeed. In addition to serving as the project’s contractor as well as one of its suppliers, we also had the opportunity to get in on the creative side of the project: For the kiddie pool, we fabricated a custom-designed, one-of-a-kind slide for shallow water. It took the form of a blue whale and includes a water spout as well as a kid-safe padded ladder. Now “Billy Blue,” as the slide is known, is one of the facility’s most popular calling cards – and for us a point of particular pride. Billy Blue, well-padded and ready for fun. At every step of the way, we knew how important the aquatic center was to the city and how, after more than 80 years, it had woven itself into the fabric of the town’s identity and social life. With tradition and heritage in mind, everything we did on site was an expression of regional spirit and we did our best to ensure the facility’s long-term performance. On opening day, the people of Vincennes showed up in droves – as did folks from a number of surrounding communities. The place was packed, and it stayed that way straight through its first summer. The facility’s success was the result of a detailed, open collaboration between city officials, local citizens, local businesses and numerous design, engineering and construction contractors. Old timers might not recognize Rainbow Beach as they review childhood memories of the original facility and its sandy beach, but generations to come will enjoy the new aquatic center and all of the thought, care, blood, sweat and tears the community invested in making it a landmark that will stand the test of time.